Wind is actually a form of solar energy; winds are caused by the heating of the atmosphere by the sun, the rotation of the earth, and the earth's surface irregularities. For as long as the sun shines and the wind blows, the energy produced can be harnessed to send power across the grid. Wind power is the most cost effective renewable energy source today. Cost per KW of wind power is much lower than other renewable energy sources. Wind power turbines can be deployed in Farms in rural areas. Farmers and ranchers can continue to work the land because the wind turbines use only a fraction of the land. In this way, remote areas that are not connected to the electricity power grid can use wind turbines to produce their own supply. Wind turbines are available in a range of sizes which means a vast range of people and businesses can use them. Single households to small towns and villages can make good use of range of wind turbines available today. Traditional energy sources are the most efficient energy source in the world. But, they are not environment friendly and are running out of us. Dependence on the fossil fuels could be reduced to much extent if wind energy is adopted on the much wider scale by all the countries across the globe. Wind energy can replace electricity from coal-fired power plants and thus reduces greenhouse gases that produce global warming. Wind energy on the other hand has created many jobs for the local people. From installation of wind turbines to maintenance of the area where turbines are located, it has created wide range of opportunities for the people. Though wind energy does not create environment problems, the turbines may produce noise pollution. The strength of the wind is not constant and it varies from zero to storm force. This means that wind turbines do not produce the same amount of electricity all the time. As well as other renewable energy sources ,one of the main disadvantages of wind energy is lack of large scale energy storage system. New technologies should be developed to overcome this difficulty. 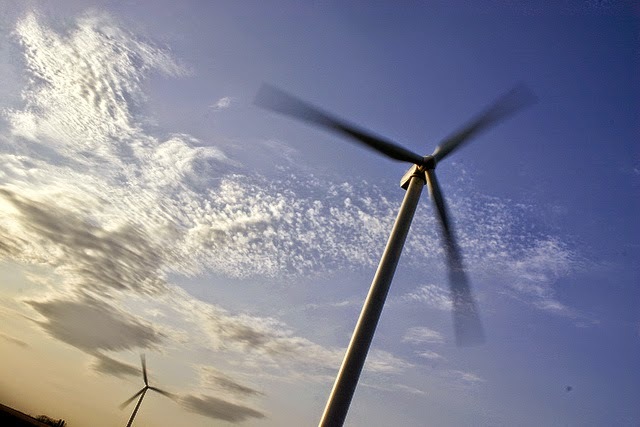 Wind turbines are usually made of blades that rotate continuously and fiercely. Due to the fact that the blades are usually placed high up in the air, they are known to kill birds that fly over it. Due to large scale construction of wind turbines on remote location, it could be a threat to wild life near by. wind speed before deploying wind turbines. The location of a wind power system is crucial, and one should determine the best possible location for wind turbine in order to capture as much wind as possible. Coupling another source of energy with wind energy can help to provide continuous power supply to the grid. Though many people believe that wind turbines actually look nice but majority of them disagree. People consider wind turbines to have an undesirable experience.